Korea’s start-up community breathed a collective sigh of relief last month when the government approved the long-awaited crowdfunding act, two years after it was first proposed in June 2013. Aimed at opening funding channels for start-ups, the Financial Investment Services and Capital Markets Act paves the way for equity-based crowdfunding ― a type of fund-raising method that lets individuals invest up to 2 million won ($1,700) in a single start-up, and 5 million won collectively over the year, through an online brokerage site. With the implementation of equity-based crowdfunding, the government-run Korea Institute of Science and Technology Evaluation and Planning predicts that Korean crowdfunding overall will balloon from 52.8 billion won in 2012 to an 800 billion won-1.1 trillion won industry. Start-up industry experts see the new channel as a way to supplement the shortage of seed and angel investors for early-stage start-ups in Korea, while opening up an opportunity for people to invest in nonlisted companies. Hopes are high that it will also solve the “Death Valley” funding drought faced when start-ups’ initial funds run dry, leaving them to shutter when they cannot repay their loans. The move on July 6 came at a time when President Park Geun-hye’s creative economy drive ― on a 3.1 trillion won budget this year ― is kicking into full momentum. A week after the act was passed, Park vowed that “anyone with good ideas” could easily attract funds online from angel investors through the new crowdfunding system. But entrepreneurs and industry experts criticize the investment restrictions that will taper enthusiasm for the new financial opportunity. Some are skeptical about whether Korean platforms will be as effective as hoped, especially as vetted platforms like Indiegogo and Kickstarter continue to expand their global presence. 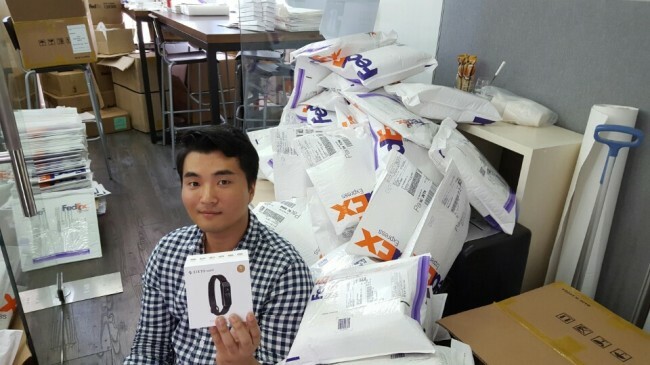 Zikto, a wearable device-maker in Seoul, raised over $164,000 this year on Kickstarter and shipped out its preorders to over 800 backers in countries ranging from Canada to Nigeria last week. Chief financial officer David Suh said the new law would benefit the crowdfunding ecosystem as a whole, but was skeptical as to whether fellow start-ups would adopt a local platform. He said Zikto would opt for a global platform because of the product’s global target market. “From the government’s and also the start-ups’ perspective, I think creating a different environmental ecosystem to get funded … that’s a great move. But in terms of outcome … I don’t know how many start-ups would actually be willing to do equity-based crowdfunding,” he said. Equity crowdfunding is fast emerging globally as an alternative to traditional venture capital. In the U.S., it is gaining momentum with Colorado and Illinois recently passing their own equity crowdfunding laws, but it is still a fairly new alternative to rewards-based crowdfunding platforms like Indiegogo and Kickstarter and Korea’s Tumblbug, Opportune and Wadiz. In equity-based crowdfunding, start-ups give investors equity or profit-sharing rights, which leads to unlimited potential for financial returns if the business does well. In contrast, reward-based crowdfunding bears little risk and no financial return for investors, but makes it an ideal channel for start-ups to pitch products with mass appeal straight to consumers. Industry experts also note that rewards-based crowdfunding platforms like Kickstarter help start-ups assess the market demand for their product or even prototype, while equity-based crowdfunding instead allows them to expand their business and focus their funds on research and development for longer-term projects. “One can also gain a huge and supportive network of minority shareholders that will help the corporation grow, and gain an infinitely supporting aid for additional funding,” said Ko Yong-gi, CEO of crowdfunding platform OpenTrade and chairman of Korea Crowdfunding Platforms, the local crowdfunding association. OpenTrade is Korea’s only platform designated for equity-based crowdfunding, although without the law it has only been running private equity campaigns limited to 49 investors each. Until now, Korean start-ups pitched to angel investors and venture capitalists. But with fewer than 1,000 angel investors in the country and local VCs being traditionally averse to such risky bids as early-stage startups, receiving investments through these methods has been difficult, according to Ko. “Start-up funds have usually been provided by the founder, or their family and friends, and if this runs out they usually received loans from both financial institutions and other institutions,” he said, noting that fewer than 400 companies less than 3 years old in Korea are receiving venture capital or seed investment. The crowdfunding bill, slated for enactment in January 2016, allows small companies to raise up to 700 million won per year. It establishes an all-or-nothing type of crowdfunding where the pledges are only fulfilled if the campaign meets a minimum specified percentage of the goal. The Financial Services Commission seeks to foster a healthy crowdfunding ecosystem for not only start-ups, but also the investors. On one hand, financial regulators are mindful of protecting investors who are willing to fund generally unknown start-ups, especially considering that many of them failed to secure investment from elsewhere. The crowdfunding act bars company owners and major shareholders from selling their shares for one year from purchase to prevent them from dumping their stock. Nor will site brokers be allowed to keep or deposit the investors’ money. But industry experts debate just how much the government should step in to ensure the investors’ protection. Crowdfunding platforms criticize the 5 million won annual limit on investors. “The cap on investment amount is disappointing, but I believe that the crowdfunding bill will allow diversity in acquiring capital and expand the start-up market,” said Choi Dong-chul, chief of crowdfunding research organization CrowdRI and the chief operating officer of Wadiz, which has been preparing to open an equity platform on top of its rewards platform. Plus, with average equity crowdfunding campaigns globally raising 200 million won, these types of fundraisers have much bigger potential, he noted. Yang Joon-cheol, chief of OnOffMix, an event-planning start-up that raised 700 million won in 2013 through OpenTrade, recalled the venture investment boom a decade ago, when investors made high margins and jumped in indiscriminately. “Some companies that received investments used the money for their individual benefit rather than for the company, which hurt investors and soured the investment atmosphere,” he said. But he noted the negative sentiment would cool off when more success stories arise. Ko of OpenTrade noted that the government plans to establish a control tower that manages crowdfunding platforms and start-ups through the revised law. But he warned that excessive government control would limit the public’s freedom and increase the need for even more government intervention. He suggested that experienced investors should be able to invest without limit, while designating “leader” investors to help the market grow freely. Zikto found that crowdfunding was a necessity for attracting venture capital. After its campaign, it secured a private equity fund, sealed a new VC funding deal and was approached by three local manufacturers to supply for them. But he added that crowdfunding was an extremely tough and time-consuming effort, and suggested that if a start-up just wanted to raise funds without concern for global marketing, it should just apply for a government grant, which is relatively easy to get and does not require giving up any ownership as equity crowdfunding does. Korean start-ups are getting familiar with the crowdfunding idea, but many, like Zikto, are opting to head straight to global platforms. Companies like K-seed are helping Korean start-ups facing language or marketing difficulties to get there, leaving Korean platforms to catch up with an already developed global market. Ko of OpenTrade believes Korea is still unknown in the world’s start-up scene due to language and investment barriers. But that makes it a hidden gem, he says, predicting that the law would herald a $1 billion economic impact over the next five years. “I believe Korean crowdfunding platforms will achieve a higher quantum jump than foreign crowdfunding platforms by exposing the innovativeness of Korean start-ups and matching them with multiple investors,” he said. On that front, he said OpenTrade strengthened its competitiveness by striving for a global platform with content translated into multiple languages. Small Korean start-ups can also use equity campaigns as a stepping-stone to move on to global platforms, said Youn Hee-sung, CEO of Stone Ent, an entertainment audition and events start-up running a 50 million won campaign on OpenTrade. “I believe they will (catch on) when they perceive it as a matter of investment such as stocks, bonds, real estate and exchange rates and that you can become a shareholder of a company with a small stake. More promotion and incubating instances are needed,” Youn added. Choi of Wadiz said crowdfunding platforms will shift the start-up funding paradigm in Korea, but their survival depends on improving the risk-minimizing yet restrictive policies.